Modern Sprout: a new player in the indoor gardening world! As much as I've enjoyed hydroponic gardening with the Aerogardens over the past five years, I have to admit that as much as Aerogrow has tried to make the Aerogarden units prettier to fit into home decor (even going so far as to making one unit look like a ladybug), the big gurgling plastic monstrosities tend to be somewhat of an eyesore. Plus, I really don't like how you have to buy proprietary seed pods, motors, nutrient at ridiculous prices just to keep the thing moving. Well, it seems there's a new kid on the block. There's a husband-and-wife team in Chicago who have a new start-up called Modern Sprout. As so many innovative entrepreneurs do, they went onto Kickstarter to tell the world about their idea, and the Kickstarter community embraced it enthusiastically. The couple, Nick and Sarah, faced the same issues and frustration in their Chicago apartment that I've talked about on this blog and on indoorherbgarden.org that I've faced in my New York apartment, namely, wanting to grow healthy, vibrant plants, but not having a balcony or real windowbox I could use. 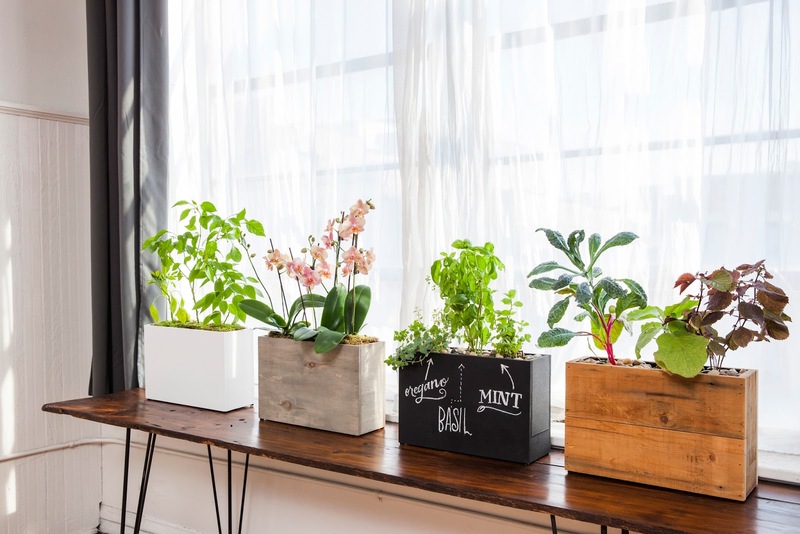 Their ingenious idea was to create a "windowbox" planter that sits inside and runs on hydroponics. They put a lot of thought into their product. Here's what the product looks like--notice they have designs ranking from modern looks, to wooden boxes, to chalkboard boxes. They'll be selling a few different models on their site at various prices. If the product works as beautifully as it looks, I think Nick and Sarah are going to do very, very well, given the number of you who's written in over the years to share your thoughts on the need for an indoor herb growing solution that actually works and won't break the bank. Hopefully I can try one of these out someday and let you know how it works, but if you've been able to use one of these, please leave a comment and let us know what you think!